Just a short update to let anyone reading know the latest on my Higher Education Academy funded project. 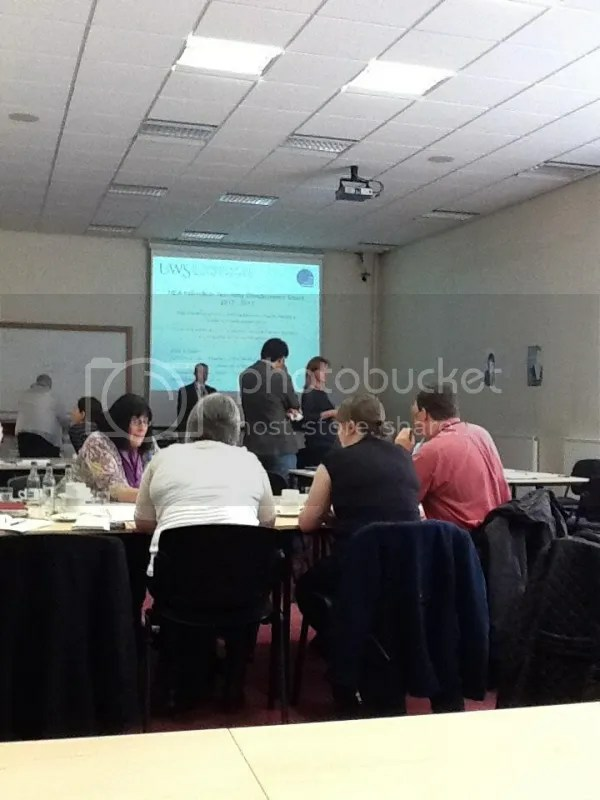 I presented an update on my progress along with some preliminary findings yesterday, Thursday 30th May 2013 at a small HEA half-day conference that happened to be held at the University of the West of Scotland – so it was only a 5 minute walk from my own office to get to the venue! The conference was titled: Disseminating outcomes of Teaching Development Grant projects in Scotland, with the given remit “Disseminating practice and the benefits of undertaking a Teaching Development Grant project“. Preparing to start my presentation – HEA Teaching Development Grant Conference, UWS, 30th May 2013. Picture courtesy HEA. The results I was presenting were indicators from the summative assessment for the law of evidence module which covered the areas used by students in their courtroom observations during phase one of the project. By comparing their results to those results of students who did not take part in the practical phase and only learned about the subject via traditional classroom teaching, this allowed for some analysis on the areas of understanding and retention of key concepts. Thus far, the results are positive as the indicators are that indeed those students that took part in the practical phase of the project have improved performance relative to those that only learned in the classroom. These results will only be corroborated following some further analysis of both the summative assessment and also the set questions given to students during both phase one and two. At present I am still awaiting receipt of a few of these sets of questions prior to the final focus group to round off the project. It is anticipated that all of this will be complete within the next 4-6 weeks, allowing the remainder of the summer for analysis, refinement of results, and creating a full dissemination plan. Further updates will be made as progress continues.